Malaysia’s cuisine is influenced by many cultures from within the country and from the surrounding regions, including the Chinese, Indian, Thai, Javanese, and Sumatran cultures. Kaya Malay Bistro does a fair job at representing the country’s multi-ethnic cuisine by incorporating many culturally traditional foods while adding a Western influence. This relatively new restaurant (only a few months in business), has a warm and inviting atmosphere that exudes a fine dining feel while providing casual and friendly service, and food at a fair price. Take for example the eight-course tasting menu that costs only $28/person with the option of adding two wine pairings for $7. At this price it seems like a no-brainer for those who like to sample a bit of everything but also provides a slightly daunting feat of making it through all of the courses. I was there for a media event where we had essentially the eight course meal with a few adaptations including the addition of the chicken skewers. This is the oddest mish-mash of ingredients I have seen in a salad. That said, I’ve never been to Malaysia, and surprisingly it actually worked. Doused in dressing (maybe too much) this was a sweet and savory salad that in a full portion could stand on its own as a meal, complete with protein, fiber and vitamins. I enjoyed the texture and the random assortment of flavours even if it seemed like a confused dish. Perfect for the season, this dish was a hit with its hearty flavour and warming effect through temperature and spices. The consistency was thick as all bisques are meant to be and topped with a crème fraîche to tone down the curry spices and a fresh basil leaf for aesthetics and flavour. Well some people at the table felt that the roti was too greasy I thought it was a delicious with its crisp exterior and soft middle – the way every roti should taste in my eyes. This basic dish made from flour, water, salt and oil surprisingly holds flavour and is utterly addicting when dipped in Kaya’s curry dipping sauce. My side of the table licked that little dip dish clean. Not typically a calamari lover unless I get a lot of the meaty body pieces, I actually quite enjoyed Kaya’s version of the deep-fried squid dish. Although the majority of the dish was tentacles, they were of decent size allowing the squid taste to come through rather than just tasting the batter. On their own, the pieces have a fair amount of flavour but if you like a little kick as I do the tamarind chili sauce is a nice complement. The taro root I could do without as they looked like microwaved McDonald’s fries, but had even less flavour. The chicken skewers were a crowd pleaser and definitely one of my favorite dishes. Most skewers had roughly six chunks of chicken on them which impressed me as many restaurants skimp out with four or so. I love the charcoaled essence that you could taste in every bite and the fact that they marinated the meat beforehand. The spicy peanut dip accompanying it had a sweet peanut taste to it with only a bit of spice and a hearty consistency. I loaded them up even though they were flavourful enough on their own. The pineapple was a nice touch and could act as a means of toning the heat down if one had a sensitive palate. The cucumber was odd but I never complain about the addition of vegetables in a dish. I re-discovered the fact that I don’t like okra through this dish. That’s not saying that it wasn’t well-prepared, it’s just that the flavour and texture isn’t for everyone. The spicy shrimp paste also didn’t do it for me and is often an acquired taste which made it hard for me to enjoy the eggplant too. Both were cooked firm but tender so I had no complaints in that department. I’m the kind of person that peels off the skin of chicken. I don’t like the fatty texture in my mouth which is unfortunate because that’s where all the flavour of a roast chicken is usually held. Since I lost a bit of flavor because of my mannerisms I needed the addition of the sauces, favoring the ginger because of it’s nice flavour that didn’t overpower the poultry. Both pieces of chicken were moist and juicy and….cold. This isn’t a mistake as the chicken is chilled before served but to those who don’t read the menu, it may come as a surprise. There’s nothing worse than over-cooked halibut and sadly it was very much so in this dish. Although equipped with a shallot, garlic and ginger sauce that was sweet, sticky and sprinkled with fresh garlic chunks, it still couldn’t mask the dryness of the fish. On the bright side, the green beans were fantastic and I could have eaten a plate of them on their own. I forgot that we were getting this dish and in retrospect should not have eaten that extra skewer of chicken and the extra handful of calamari, but I couldn’t help myself at the time. When something tasty is in front of me I feel obliged to eat it as if this could be the last yummy thing I eat. Despite feeling full, after a sip of my Cab Merlot I felt ready to eat some lamb. Typically I like it on the rarer side but this dish was quite well-done. That said, it was still tender and was such a small piece of meat that it didn’t matter much anyhow. Combined with a bite of the yam mash it was a very enjoyable dish. Before even being served the durian I was warned that it smells like dirty socks and that I’d either love it or hate it. The verdict? While hate is a strong word, it is leaning that way. Biting into something that has been prefixed that way is never an easy feat but I managed to swallow two bites before deciding that it really wasn’t my thing. Maybe dirty socks and mango wrapped in pandan leaf is popular with some people? My favorite on the plate was the tapioca and coconut cream cup with its unfamiliar texture to me as a dessert and with its slightly sweet and unusual flavor. Tapioca has a distinct yet bland taste so the hint of coconut really helped the dessert. The deep-fried banana was lacking in flavour but loaded with greasiness. I think they needed to use a sweeter banana or even drizzle a little of honey on it. On the regular menu it is accompanied by ice cream. At the end of the meal we had a chance to chat with Chef SinSer Lim, Author and Foodie, Stephanie Yuen and the Director of Kaya, Scott Kwan. Stephanie Yuen invited us to the restaurant to sample the menu items eager to hear our thoughts. Chef Lim and Scott Kwan thanked us for coming to their restaurant, hopeful that we enjoyed our meal as they are very proud of the menu items they serve at Kaya Malay Bistro. 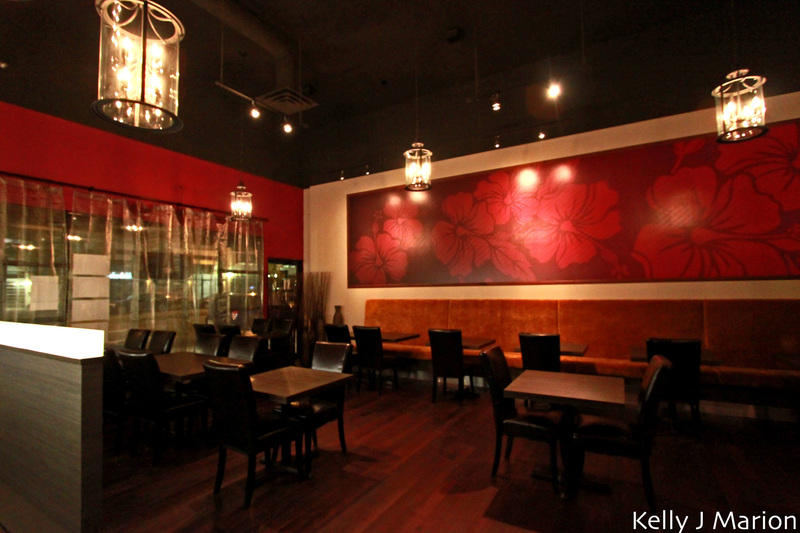 Kaya is located at 1063 W Broadway, Vancouver. For more information and to see their menu check out their website. For more photos check out my Kaya Malay set on Flickr.